This is the video game art book for the highly acclaimed Shin Megami Tensei: Persona 3. The Japanese edition of this book ペルソナ3 公式設定資料集 was originally published in 2006. Udon does a great job at translation, as usual. The book only has 144 pages so that's quite thin compared to other Udon art books. It collects the character designs, sketches, storyboards, backgrounds, miscellaneous in game items, and interviews with the creators, producer and director Katsura Hashino (橋野桂) and Shigenori Soejima (副島成記). The character designs are from Shigenori Soejima who designs not just this but for other Persona games as well. The character designs are in the form of coloured illustrations, sketches, in-game screenshots of poses and costume changes. 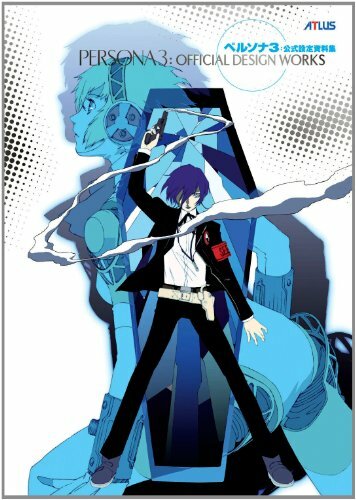 Chapter 2 covers Persona and Shadow. Initial and ultimate Persona are both included. The background art consist of sketches and the coloured version. It's a short section with 6 pages. There are only 6 colour illustrations and each is printed smaller than quarter-page size. The sketches are larger but not all sketches have coloured versions included. There are a few pages of splash art. Some you might have seen in Shigenori Soejima Art Works 2004-2010. Not much is duplicated. It's a good book but I feel that fans of the game and the Persona series will enjoy it more.